Study Master of Medical Sonography at the University of South Australia (UniSA). Information for International students. 4.5 units* of successfully passed study or equivalent at a minimum of Bachelor degree level (AQF 7) of Human Pathology or Pathophysiology. Note: Applicants are advised that this program requires the completion of 2200 hours of supervised ultrasound scanning experience. Applicants are responsible for organising their own training position in an ultrasound department in order to acquire this scanning experience across the first eight courses of the program. If you are a New Zealand-based student, please visit the IMSOF page for further information. This program is offered on a part-time basis over a minimum of 3 years, and is offered only by external delivery. Broaden your career opportunities by extending your knowledge, practical skills and understanding of ultrasound imaging health trends. Pursue a clinical project or research pathway in your final year. Learn from a University that has well-above world standard research in Clinical Sciences1. Focus on areas such as fetal echocardiography, obstetrics, advanced musculoskeletal sonography, management and ethics, or research. Get practical experience when you complete 2,200 hours of ultrasound scanning experience and associated clinical examinations as part of your studies. Benefit from flexible study options. 1Excellence in Research for Australia (ERA). If you are a medical radiation or other allied health professional and want to broaden your career prospects, this master degree may be for you. In just three years of part-time study you will extend your knowledge, practical skills and understanding of medical sonography, with the opportunity to learn advanced clinical skills, or pursue research. This is great news for students who want to study in among work and other life commitments, giving you the freedom to learn wherever, whenever. Practical learning is a major focus, with students embarking on 2,200 hours of ultrasound training and associated clinical placements. This degree in only offered online, with attendance at an on-campus final clinical assessment. This qualification may also suit qualified sonographers seeking to upskill in an area of interest. Through a combination of theory and practice you will gain advanced technical skills and a strong understanding of health science, physics, anatomy and pathology. You can choose to study areas of your interest, including fetal echocardiography, obstetrics, advanced musculoskeletal sonography, management and ethics, or research. You will also be required to complete at least 2,200 hours of supervised ultrasound scanning experience (verified by an ASAR accredited sonographer or equivalent). 1. 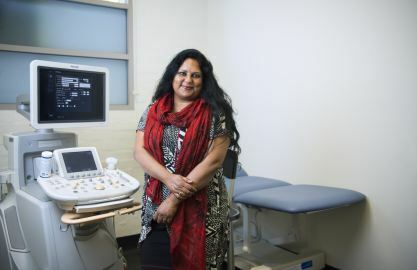 Students who have successfully completed the Graduate Diploma in Medical Sonography from the University of South Australia (or equivalent) will be granted 36 units of credit and will commence the program from level 3. 2. Credit will be given for this course if the student can provide proof of completion of the Diploma of Medical Ultrasonography Part 1, awarded by the Australasian Society for Ultrasound in Medicine, within 5 years prior to enrolment in the program. 3. Students must successfully complete these 4 courses prior to enrolling in the remainder of the program. 4. Students must provide evidence that they have a supervised external training position for the duration of these courses. For all domestic students and for international students training in Australia, supervision must be provided by a sonographer(s) registered with the Australian Sonographers Accreditation Registry (ASAR). 5. Students must maintain a clinical experience logbook which documents a minimum of 2200 hours of supervised ultrasound experience (verified by an ASAR accredited sonographer) over the duration of the program. Students will be required to submit evidence at prescribed milestones set by the Program Director. 6. At the completion of this course students must submit a Clinical Progress Report. 7. Students must have completed at least 2000 hours of clinical sonography experience and at least 2 Clinical Progress Reports to enrol in this course. 8. Students must select either the Research or Project pathway of study from this point in their program. 9. Students undertaking this pathway must have written agreement from a suitably qualified member of staff that they are willing to supervise the student for the duration of the pathway. 10. For this course a knowledge of general medical sonography scanning principles will be assumed. Co-requisite is that the student must be an accredited medical sonographer and working in an environment where diagnostic medical sonography is performed. 11. Participation is required in clinical placements where students are required to physically handle people including lifting and supporting people with disabilities. 1. The program is offered on a part-time basis over a minimum of 3 years, and is offered only by external delivery. 2. Students who are unable to secure a training position after completing level 1 courses in the program will be offered exit with a Graduate Certificate in Medical Sonography Principles and Theory. The Graduate Certificate exit award will NOT provide the student with ASAR accreditation. This degree is a great option for those wanting the flexibility that comes with online learning – we offer accessible digital learning facilities and dedicated support staff who are with you every step of the way. Together with teaching staff who are above world-class researchers in the field, and industry experienced, you are assured the very best in academic resources, learning facilities and support. Practical learning is also a major focus, with students embarking on 2,200 hours of ultrasound training and associated clinical examinations. Here you will gain valuable real-world skills and important industry contacts. You can also use this qualification as a pathway to further research studies, including a doctoral qualification. We are fast becoming a renowned centre of innovation and enterprise in the sectors that will drive Australia's future, such as health and biomedicine. It’s a very good time to choose UniSA for your postgraduate study. Learn from world-class researchers and experienced medical sonography professionals via our online collaborative environment. These important virtual classes offer the opportunity for you to learn from clinicians in the field, and also enables and encourages the building of important industry networks and relationships. During your studies you will complete 2,200 hours of ultrasound scanning experience and clinical examinations where you will be supervised by practicing clinicians. This is an opportunity for you to further develop your practical skills and to network. Sonographers require highly developed technical skills and a strong understanding of health science, physics, anatomy and pathology for examination of body parts such as internal organs, blood vessels, the heart and reproductive organs. As a masters graduate you may also choose to pursue a career in research – if you do choose to pursue a career in research you can further your studies with a Masters by Research or a Doctor of Philosophy qualification. Employment for medical imaging professionals in Australia is projected to increase by 5,900 (29.7 per cent) by November 20201. As Program Director, I am fortunate to lead a strong team of academics who have a diverse range of industry experience, along with national and international professional affiliations. My strong interest in education research fuels my focus on arming students with the knowledge and capabilities required for lifelong learning which are essential in the industry, such that they will continuously seek the best practice evidence for translation into their professional roles. Hear from the program director and successful graduates and find out more about what you can expect in this program and the career opportunities in the field.